2. Before 1999: Austrian Schilling. Austria later became engaged in a war with Revolutionary France - at the beginning highly unsuccessful - with successive defeats at the hands of Napoleon meaning the end of the old Holy Roman Empire in 1806. Two years earlier, in 1804, the Empire of Austria was founded. In 1814 Austria was part of the Allied forces that invaded France and brought to an end the Napoleonic wars. It thus emerged from the Congress of Vienna in 1815 as one of four of the continent's dominant powers and a recognised great power. The same year, the German Confederation, (ਜਰਮਨ: Deutscher Bund) was founded under the presidency of Austria. Because of unsolved social, political and national conflicts the German lands were shaken by the 1848 revolution aiming to create a unified Germany. A unified Germany would have been possible either as a Greater Germany, or a Greater Austria or just the German Confederation without Austria at all. As Austria was not willing to relinquish its German-speaking territories to what would become the German Empire of 1848 the crown of the new formed empire was offered to the Prussian King Friedrich Wilhelm IV. In 1864 Austria and Prussia fought together against Denmark, and successfully freed the independent duchies of Schleswig and Holstein. Nevertheless as they could not agree on a solution to the administration of the two duchies, they fought in 1866 the Austro-Prussian War. Defeated by Prussia in the Battle of Königgrätz, Austria had to leave the German Confederation and subsequently no longer took part in German politics. On October 21, 1918, the elected German members of the Reichsrat (parliament of Imperial Austria) met in Vienna as the Provisional National Assembly for German Austria (Provisorische Nationalversammlung für Deutschösterreich). On October 30 the assembly founded the State of German Austria by appointing a government, called Staatsrat. This new government was invited by the Emperor to take part in the decision on the planned armistice with Italy, but refrained from this business, leaving the responsibility for the end of the war on November 3, 1918 solely to the Emperor and his government. On November 11 the Emperor, counseled by ministers of the old and the new government, declared not to take part in state business any more; on November 12 German Austria, by law, declared to be a democratic republic and part of the new German republic. The constitution, renaming Staatsrat to Bundesregierung (federal government) and Nationalversammlung to Nationalrat (national council) was passed on 10 November 1920. 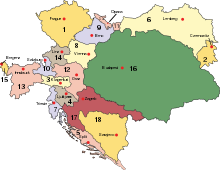 The Treaty of Saint-Germain of 1919 (for Hungary the Treaty of Trianon of 1920) confirmed and consolidated the new order of Central Europe which to a great part had been established in November 1918, creating new states and resizing others. 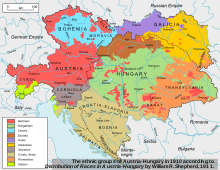 However, over 3 million German Austrians found themselves living outside of the newborn Austrian Republic in the respective states of Czechoslovakia, Yugoslavia, Hungary and Italy. Between 1918 and 1919, Austria was officially known as the State of German Austria (Staat Deutschösterreich). Not only did the Entente powers forbid German Austria to unite with Germany, they also ignored the name German Austria in the peace treaty to be signed; it was therefore changed to Republic of Austria in late 1919. After the war, an enormous inflation started to devaluate the Krone, still Austria's currency. In the autumn of 1922, Austria was granted an international loan supervised by the League of Nations. The purpose of the loan was to avert bankruptcy, stabilize the currency, and improve its general economic condition. With the granting of the loan, Austria passed from an independent state to the control exercised by the League of Nations. In 1925, the Schilling, replacing the Krone by 10,000: 1, was introduced. Later it was called the Alpine dollar due to its stability. From 1925 to 1929, economy enjoyed a short high before nearly crashing after Black Friday. The First Austrian Republic lasted until 1933 when Chancellor Engelbert Dollfuss, gladly using what he called "Self-switch-off of Parliament" (Selbstausschaltung des Parlaments), established an autocratic regime tending towards Italian fascism. The two big parties at this time — the Social Democrats and the Conservatives — had paramilitary armies; the Social Democrats' Schutzbund was now declared illegal but still operative as civil war broke out. In February 1934, several members of the Schutzbund were executed, the Social Democratic party was outlawed and many of its members were imprisoned or emigrated. On 1 May 1934 the Austrofascists imposed a new constitution ("Maiverfassung") which cemented Dollfuss's power but on 25 July he was assassinated in a Nazi coup attempt. His successor Kurt Schuschnigg struggled to keep Austria independent as "the better German state", but on 12 March 1938 German troops occupied the country while Austrian Nazis took over government. On 13 March 1938 the Anschluss of Austria was officially declared, and two days later Hitler, a native of Austria, proclaimed the "re-unification" of his home country with Germany on Vienna's Heldenplatz. He established a plebiscite confirming union with Germany in April 1938. Austria was incorporated into the Third Reich and ceased to exist as an independent state. The Nazis called Austria "Ostmark" until 1942 when it was again renamed and called "Alpen-Donau-Reichsgaue". Vienna fell on 13 April 1945 during the Soviet Vienna Offensive just before the total collapse of the Third Reich. Karl Renner astutely set up a Provisional Government in Vienna in April with the approval of the victorious Soviet forces, and declared Austria's secession from the Third Reich by the Declaration of Independence on 27 April 1945. Much like Germany, Austria, too, was divided into a British, a French, a Soviet and a U.S. Zone and governed by the Allied Commission for Austria. As forecast in the Moscow Declaration in 1943, there was a subtle difference in the treatment of Austria by the Allies. The Austrian Government, consisting of Social Democrats, Conservatives and Communists and residing in Vienna, which was surrounded by the Soviet zone, was recognized by the Western Allies in October 1945 after some doubts that Renner could be Stalin's puppet. Thereby the creation of a separate Western Austrian government and the division of the country could be avoided. Austria, in general, was treated as though it had been originally invaded by Germany and liberated by the Allies. After talks which lasted for years and were influenced by the Cold War, on 15 May 1955 Austria regained full independence by concluding the Austrian State Treaty with the Four Occupying Powers. On 26 October 1955 Austria declared its "permanent neutrality" by an act of Parliament, which remains to this day but has been indirectly changed by constitutional amendments concerning Austria as member of the European Union. The political system of the Second Republic is based on the constitution of 1920 and 1929, which was reintroduced in 1945. The system came to be characterized by Proporz, meaning that most posts of political importance were split evenly between members of the Social Democrats and the People's Party. Interest group "chambers" with mandatory membership (e.g. for workers, business people, farmers) grew to considerable importance and were usually consulted in the legislative process, so that hardly any legislation was passed that did not reflect widespread consensus. Since 1945, a single-party government took place only 1966−1970 (conservatives) and 1970−1983 (social democrats). During all other legislative periods, either a "Grand Coalition" (conservatives and social democrats) or a "Small Coalition" (one of these two and a smaller party) ruled the country. Brook-Shepherd, Gordon (1997). The Austrians: A thousand-year odyssey. Carroll & Graf Publishers, Inc. ISBN 0786705205. CIA World Factbook—Austria. Retrieved on December 7, 2007. Johnson, Lonnie (1989). Introducing Austria: A short history. Ariadne Press, 270 Goins Court, Riverside, CA 92507. ISBN 0929497031. Jelavich, Barbara (1987). Modern Austria. Cambridge University Press. ISBN 0-521-31625-1. Schulze, Hagen (1994). States, Nations and Nationalism. Blackwell Publishers Inc, 350 Main Street, Malden, Massachusetts 02148, USA. ↑ "Total population - At 1 January". Eurostat. 2009-01-01. Retrieved 2009-05-27. ↑ 2.0 2.1 2.2 2.3 "Austria". International Monetary Fund. Retrieved 2009-04-22. ↑ "ਆਸਟਰੀਆ ਦੀ ਜਨ-ਸੰਖਿਆ ਦੇ ਬਾਰੇ". www.statistik.at. Retrieved 2007-02-24.